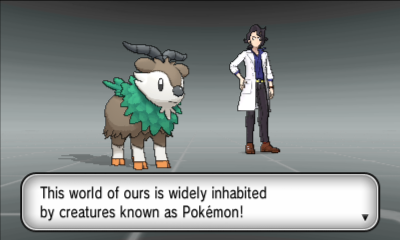 When you first turn on the game, you'll be greeted by Professor Augustine Sycamore, the Pokemon Professor of the Kalo region. He asks you to choose if you're a boy or girl, your appearance, and your name. 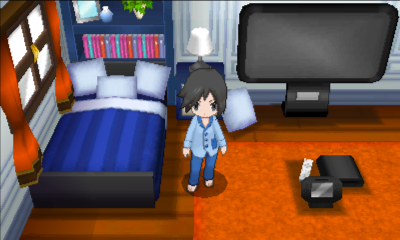 Afterwards, a Fletchinder flies to your room where you'll wake up from a nap. Explore your room a little. You have a computer, Wii U, and a big screen TV. Go up to the mirror and press "A" and you'll change out of your pajamas into your adventure clothes. Go downstairs and you'll find your mom cooking. She tells you to go meet your neighbors. 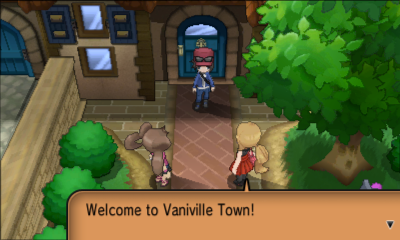 When you walk outside, you'll meet Serena (or Callum if you're playing as a girl) and Shauna. After talking to you about Professor Sycamore and how he'll give all of you Pokemon, they rush out through the northern gates. Follow them out. Protip: Hold "B" while walking to run. 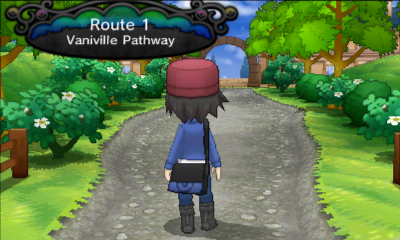 There's pretty much nothing on Route 1; it's just a straight path to Acquacorde Town.